Pakistan Telecommunication Company LTD (PTCL) has launched country wide Vfone New Year offer, which has especially been designed to encourage the existing and potential vfone subscribers in Pakistan. Load a Vfone scratch card of higher denomination and get instant free balance as much as you want! Naveed Saeed SEVP Commercial Said that PTCL always try to provide best packages and offers to our customers and this launch will have an added effect on segmenting our customers, he further added that PTCL has always and will always strive to provide our customers with the best and most affordable services. Syed Asim Ali EVP Commercial Planning said these new packages will reinforce PTCL image as the customer oriented organization and it will be our top priority to facilitate our customers to the maximum. Keeping in mind the needs of customers, In future PTCL will introduce more such offers to facilitate our users. I loaded a Rs.100 card 2 days back with unlimited package. My credit is now zero after call on PTCL number (which is unlimited) in only 2 days. Ye Validity ka Chakker daal kar Saara maza Kharab Kar dia PTCL ne. AOA, I WANT TO SUGGEST TO VFONE SERVICE PROVIDER THAT THEY SHOULD MAINTAINED THEIR CALLING ATLEAST EQUALENT TO UFONE, ESPECIALLY OFF NET CALLING TARIFF IS VERY HIGH. 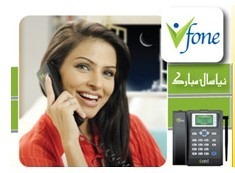 OFFNET LOW CALLING TARIFF WILL ATTRACT THE CUSTOMER TO USE VFONE, OTHERWISE THERE IS NO ATTRACTION IN VFONE SERVICE.